...Use it , don't waste it! Make this Wrapping Paper Card, and put those lovely papers to some use. Waste not, want not... and save money too. Make some lovely cards from the pretty papers that you have left over from Christmas and Birthdays. Whether the gift was sent or received by you. 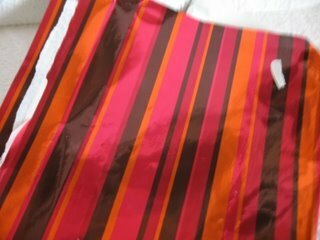 This shiny piece was around some chocolates for my birthday and was much to good to throw away. 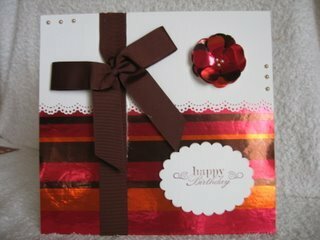 This card is made following the Big Cards instructions, and a border punch to scallop the edges. The paper was glued to the front, before the border edge was stuck in place, leaving the fancy edge visible to the front of the card. The ribbon from the gift was also used as it was too good to throw away. A quick press with the iron and it was good to go. 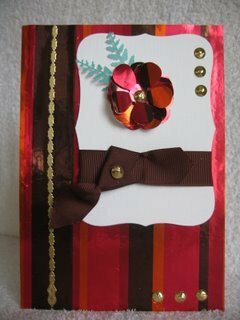 The flower was Punched out several times for both cards and then layered together. Various Embellishments, have been used to finish both, and Spellbinders die cuts used to create the panels. Recycling is a much better alternative to just throwing such good paper away. Just take another look at all the papers you have lying around your home and see if you can't put some of them to good use on your cards.